Heat oven to 375°F. Line cookie sheet with cooking parchment paper. In medium bowl, mix cream cheese, granulated sugar and 4 teaspoons lemon peel with electric mixer on medium speed until well mixed and no lumps remain. Unroll dough on work surface and separate into 4 rectangles (press the diagonal or triangle perforations in each rectangle). Cut each of the 4 rectangles in half, forming 8 rectangles (3x3 1/2 inches each). Spread 2 tablespoons of the cream cheese mixture over each dough rectangle to within 1/4 inch of the short ends. Roll up each rectangle, starting with shortest side, and pinch seam to seal. Place on cookie sheet, seam side down; brush with melted butter. Bake 11 to 14 minutes or until golden brown. Cool 10 minutes on cookie sheet. In small bowl, mix icing sugar and 2 teaspoons of the lemon juice. If necessary, add additional lemon juice, 1/2 teaspoon at a time, until thin enough to drizzle. 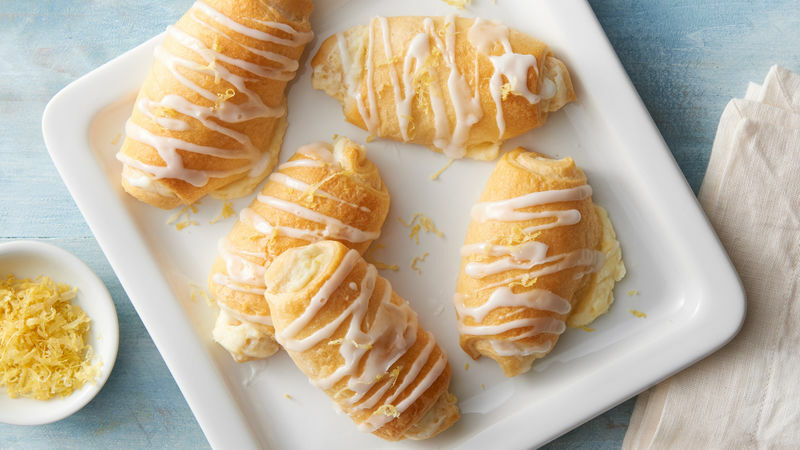 Drizzle over warm crescent roll-ups, and garnish with additional grated lemon peel. Serve warm. Cream cheese may be softened in the microwave. Remove wrapper, place on microwavable plate, and microwave on High 10 to 20 seconds.